CHICAGO, Oct. 1, 2018 /PRNewswire/ -- United Airlines today announced it is enhancing its transcontinental service offering customers more flights and more seats between New York/Newark and Los Angeles and San Francisco, more than any other airline. Beginning Jan. 7, 2019, United will be the first North American airline to operate the Boeing 787-10, the newest aircraft in the Dreamliner family, on select transcontinental flights between New York/Newark and Los Angeles and New York/Newark and San Francisco. United's transcontinental schedule and the aircraft give customers traveling cross-country the choice of more than 7,200 seats, with more than 1,000 premium seats per day, more than any other airline. Tickets are now available for purchase. United has enhanced its transcontinental schedule by increasing the number of flights between New York and Los Angeles and San Francisco to 27 daily flights and by adding more than 700 daily seats and 125 daily premium seats and giving customers more optimal flight times. "We have created the best schedule for our business and leisure customers by offering more choice and more convenience when planning travel between coasts. Combined with the addition of our newest aircraft, the Boeing 787-10, the schedule enhancements build on United's industry-leading on-board experience," said Ankit Gupta, United's vice president of Domestic Network Planning and Scheduling. United Airlines is the first North American carrier to operate the Boeing 787-10 aircraft. While United typically operates its widebody aircraft for international routes, it will operate its first -10 aircraft between New York/Newark and Los Angeles and San Francisco. The aircraft features 44 of United's exclusive United Polaris seats; 21 United Premium Plus seats which will initially be sold as Economy Plus; 54 Economy Plus seats; and 199 United Economy seats. The 787-10 is 18 feet longer than the 787-9 and can carry more passengers and more cargo. The 787-10 can fly up to 6,430 nautical miles, while using 20 percent less fuel than older generation airplanes. United currently operates 25 787-9 and 12 787-8 Dreamliner aircraft. 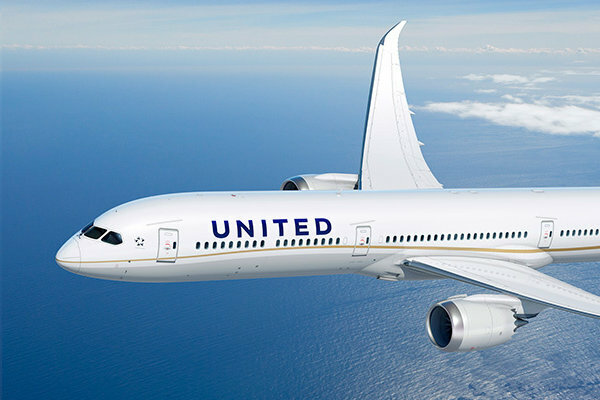 As the airline continues to execute on its comprehensive fleet plan which includes its widebody replacement strategy, United today announced an order to purchase an additional nine 787-9 aircraft. The company expects to begin taking delivery of the additional aircraft in 2020. The aircraft will be used to replace older widebody aircraft currently in service. By the end of this year United will have 40 Dreamliner aircraft in its fleet and 24 on order. United will continue to evaluate opportunities to purchase used aircraft. 180 degree flat-bed seats for a more relaxing and sleep-enhancing flight. Custom-designed duvet and pillow provided by leading luxury specialty store and New York-bred retailer Saks Fifth Avenue. Saks-themed amenity kits featuring product from Soho House & Co's Cowshed Spa. A specialty craft beverage – The Old Fashioned – by On The Rocks Cocktails. Served with a candied orange peel skewer. Hot towel service will be offered after take-off and prior to landing. Seasonally refreshed menus, developed in partnership with The Trotter Project and its critically recognized chefs including several from cities served by United's premium transcontinental service. Dining is topped off with items inspired by the popular United Polaris dessert menu which includes Ghirardelli sundae toppings with Barista Dark Chocolate Mini Chips, Ghirardelli Hot Fudge sauce, Ghirardelli Caramel sauce and Barista Caramel Flavored Mini Chips. Before arrival, a selection of snacks and hot towel service is offered. United Club access to freshen up, relax and enjoy complimentary food and beverages prior to departure or upon arrival, as well as Premier Access priority check-in and boarding. Customers seated in Economy Plus also enjoy a coastal-city-inspired menu, at no additional charge, including a complimentary hot fresh entrée, dessert and fruit, a pre-arrival snack and alcoholic beverages.